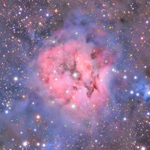 This image is an extention to the previously published image of the Cocoon Nebula. 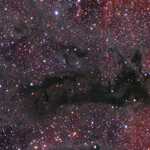 The complete dataset was reprocessed for this panoramic view that also includes the dark nebulas cataloged as LDN 1010, 1020, and 1024. Below you find similar cropped areas as in the previous version, again in 150% and 100% resolution. Click on the respective thumbnails to see the larger images. Below are three black and white images showing (1) a pure Halpha image (2) the processed luminance image, and (3) the luminance before processing. The latter image illustrates the enormous star density in this field of view.